The adventure begins. Photo courtesy of Kate Boggan. 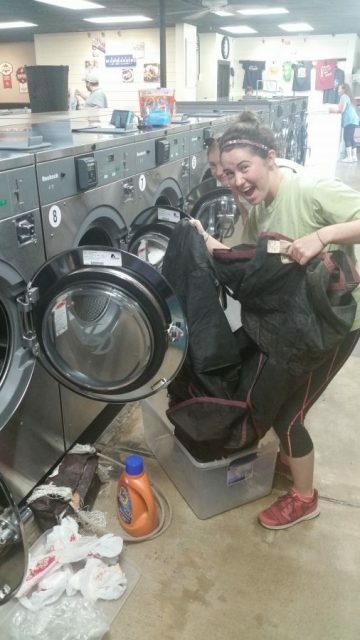 Every eventer, four-star riders to starters, has at least one thing in common: copious amounts of laundry. It’s inevitable that you’ll have saddle pads, blankets, wraps, etc. that will be soaked in sweat, feces, urine, mud, or more likely a combination of all of the above. Some of you may be methodical and on top of your laundry, but if you’re like my friends and me, you’ll have put off laundry day week after week until you’ve acquired a pile so fragrant and foul it puts even the smelliest boys’ locker room to shame. At this point you’re faced with a dilemma. Do you wash the smelly, hair covered pads and blankets at home and risk angering all the non-horsey humans you live with? Or do you brave the normal human world and try to find a laundromat that won’t kick you out as soon as the first bit of shavings hit the floor? My friends and I gathered our courage and opted for the later. Living in a college town does come with its perks. 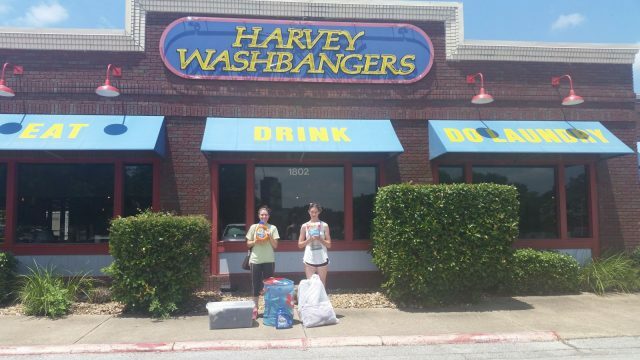 College Station, Texas is home to an establishment called Harvey Washbangers. Half laundromat, half bar and grill, Harvey Washbangers has a very tasty menu including some of the best burgers in town and even made the Texas Bucket List. There was a very distinct smell coming from our corner of the room. Photo courtesy of Kate Boggan. We arrived at our destination and tried to walk in without being noticed. No such luck. The manager held the door for us as we lugged our hampers of horse laundry inside. We chose the washing machines in the back corner of the laundromat and attempted to be as discreet as possible while frantically stuffing winter blankets in the front loaders. But living in Texas with all our dang southern hospitality makes an outing without human interaction next to impossible. A friendly employee walked over to us to make sure we knew how to work the machines properly and spotted our contraband. 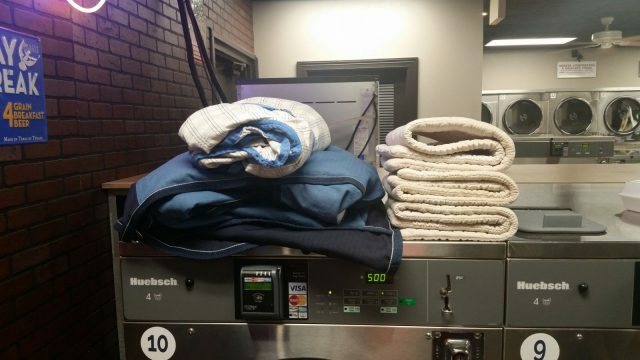 My heart dropped into my belly when he said, “Oh horse laundry,” and I was ready for the boot. But all he said was “I wondered what that earthy smell was.” I was so relieved I couldn’t bring myself to tell him that wasn’t an earthy smell; it was ammonia from horse urine. You don’t even have to get up to check on your laundry. Photo courtesy of Kate Boggan. Four washing machines full and our anxieties relieved, we headed to the grill part of the building. The chorizo burger (only in Texas) was to die for and the sweet potato fries are top notch. 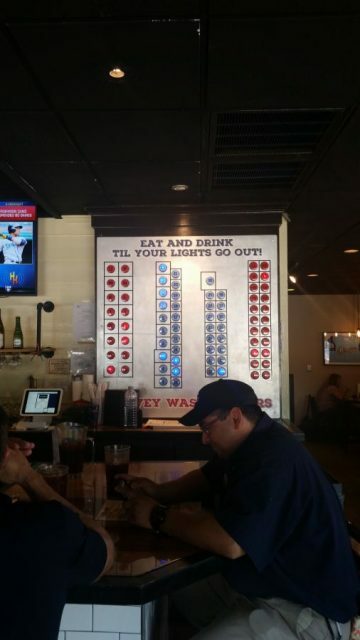 At the end of the bar there’s a light board with blue and red bulbs numbered in correspondence to the washers and dryers in the back room so you can watch for your machine to be done. Harvey Washbangers likes to tell its patrons they can “Eat and drink ‘til your lights go out,” a welcome invitation to eventers! Every horse person knows this struggle. Photo courtesy of Kate Boggan. 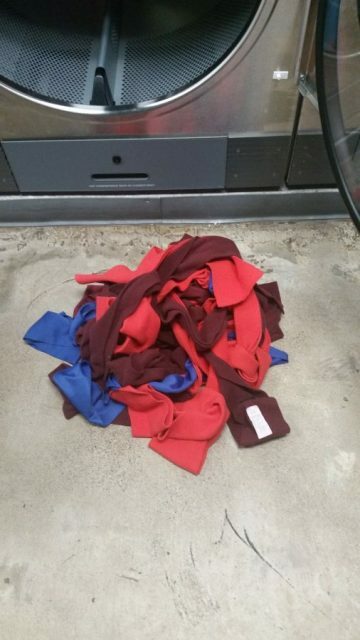 By the end of lunch our laundry was done and all that remained was to untangle my knots of polo wraps. We weren’t kicked out of the laundromat and we only got a few weird looks and wrinkled noses. It was actually a pretty fun day. Everything, even laundry, is better when done with friends (especially is food is involved). While you’ll have to travel to College Station if you want to visit Harvey Washbangers, I think some entrepreneurial minded horse person needs to take this business model and run with it. I want a chain of sports bar/laundromats across the country with cross country live streams on the TVs and “horse laundry welcome” signs on all the doors!